NOTES: Vacuform and injected plastic parts. MiniArt has been known for its superb 1/35 diorama scenes. These have been heavy gauge vacuformed plastic for the base and main structures and injected styrene for the detail bits. 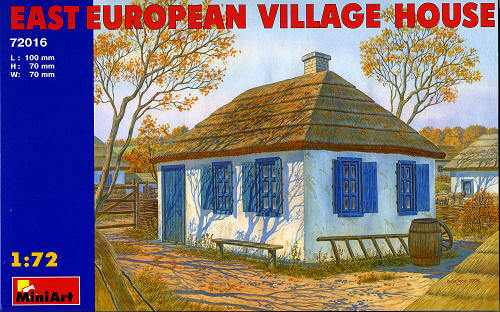 This is one of their first 1/72 diorama features and it is a single East European style house with a thatched roof. This house would be useful for dioramas from WWII back several hundred years and possibly even today where thatching is still considered a valid method for roofing. Now I can hear some of you "Vacuform, AUUUGH!". Well, in this case the vacuforming is minimal at best with only the base and the roof being vacuformed. The rest of the walls, doors and windows are injected plastic. Even the chimney is injected, though being of four sections, seems a bit much when one would think a single casting would do. The builder will have to cut open the doorway and two are provided if needed. 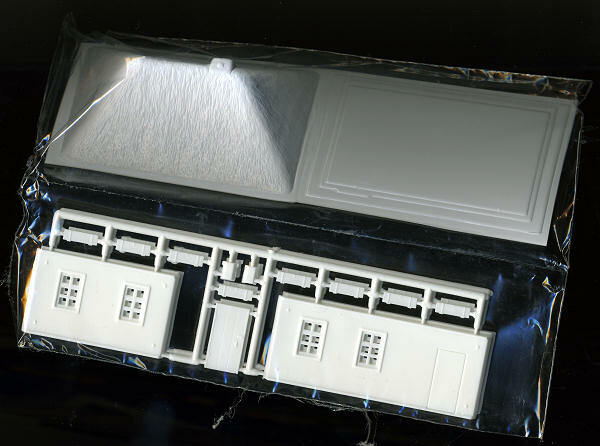 The injected parts are fairly well done, and really, once all the pieces have been removed from the sprue and cleaned, the house itself could be built in just a few minutes of gluing. I'd wait until the main walls were painted before attaching the shutters, though. The kit has the assembly instructions on the back of the box and there are no painting instructions, the box art sufficing for inspiration. It is great to see this sort of material. I know that peasant houses may not be everyone's idea of a great kit, but things like this add a huge amount to a diorama. Having it in 1/72 where this stuff is really needed is a bonus. My thanks to www.dragonmodelsusa.com for the review kit. Get yours at your favorite shop or ask them to order it for you.